Aloha from Spain, the country of paella, sangria, bulls and balconing. Just joking, we have more things than all thoose stereotypes! 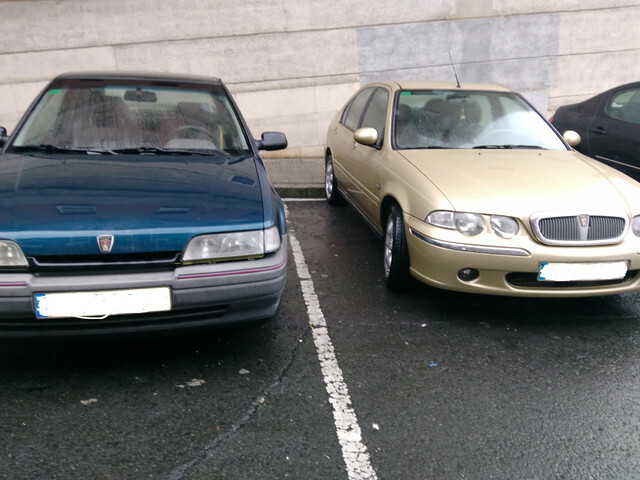 Silly jokes appart, I'm here because I want to keep my little 216 GTi in perfect shape, talk about cars with other people and share the love that the Rover brand evoke us. My uncle also have a 75 and since I have memory I remember travelling on that BIG rear side seats. I'm a proudly Rover owner since 2012, where this guy appear in my life. It's a real 2nd hand car. The previous owner bought it factory new and he sold me the car just because he was taking a new car and didn't want to see his first car going to the junkyard or being used as a 'street-racer-stupid-kid-car'. He really loved it and wanted to find a new home for his buddy. He has served as a 'university bus' since then, and after graduation, has been like a 'friend'. He has survived one little crash (no ABS, rainy day ) that smashed the front wing and the bumper, but after 1 year of being a 'two-colour-car', I painted the spare parts and now looks great again. The only 'mod' I made was that little british flag where the '16 valve' decal should be...because they stole me and I think is a nice add, why not? Proudly owner of a british car! Don't have more pics of my car, probably because of a broken HDD where I had tons of pictures. Gonna make some new pictures theese days. I always give it the best oil and the maintenance it's up to date, so I hope he is going to last till the end of the world. You can believe me or not but I have never reached the injection cut or made any 'racing' driving lessons. He is elder, and we must respect ALWAYS the elders. And that's more or less all I can say. Stay tuned for more new pics. Your steering wheel seems to be on the wrongs side good Sir ! Is this one car or two car's? Ocean Pacific Blue from the front & Black from the rear? doh! blue before the repaint! It's nice to see someone posting from Spain. Last edited by Mr Teddy Bear on Sun Feb 03, 2019 4:36 pm, edited 1 time in total. Great to see your Spanish cars. Wondered if you could tell me some more details about your Gti, what year/ 3 door or 5 door? Etc. Looking carefully at the glass, it's a three door? It's a 3 door GTi from november 91'. It's older than me! It has the 16v valve DOHC Honda engine, actually with 210.000 km (130487,95 miles). The last repair includes the oil+filters maintenance, water pump+belts and the water ¿thermostat? Since I have it the only thing that has been broken is the radiator. Hopefully I noticed the coolant leak before making a Barbecue with the cylinder head gasket. Yesterday I met the previous owner at the gym and he told me that with just 7 days with the car, the water went into the trunk through a pore in the rear window. ¿Did the Rover-MG group built this car for the british or for the Saharian weather? My idea is to restore the car when I have more time and money (actually Im competing). I want to disassemble the whole car, leaving it totally naked and paint all the rust that could have a 27 year old car. After that my intention is to keep the factory appearance with just some little extra-personal adds. But no big trims or ugly bodywork jobs. Love that e-book you made. So cute! Let's see if this weekend the weather goes better and I can take some photos. Thanks for the extra info, same engine as mine and similar mileage. There are several non-glass related ways that water gets into the boot - the rear light foam seals and the air vents are the two usual culprits. I may have a '16v' badge somewhere if you do your bare-metal restoration and want to go back to original but it does book good how it is! Another ugly looking thing are the missing of the alloy's plastic caps. I have 3 of them but miss the 4th one. Impossible to find here. Maybe at eBay. My idea is to 'desing' a 3D model and print it in case of thief or lost. I would upload the file here in the forum of course. God bless the 3D printers! Yeah, the first thing I re-sealed were both lights. Got a spare rear light in the storage room and I will check the air vents on it. When I have more time I will try to take some photos of the boot and if I'm lucky, photos of the water leak. Last time I saw the leak, was very weird because the lights where dry but the water was leaking. The particular air vents mentioned here are not part of the light clusters. They hide behind the wrap-around side wings of the rear bumper. I Googled and found this. Thanks! !